Traditionally, teaching learners who do not play an instrument and cannot read music has been quite difficult (not to mention stressful! ), especially when they are younger. Jamstudio software enables learners to compose without having to write a musical score, they compose by ear, or aurally, making decisions based on the musical effect created by the software based on their choices. A good place to start this lesson is to play examples of compositions with a strong subject matter or theme. We particularly like Nikolai Rimsky-Korsakov’s Flight of the Bumble Bee and Leroy Anderson’s The Typewriter. The inspiration for each piece is evident immediately. Do not tell learners the names of the compositions. Allow them to guess. Whatever their guesses, ask them why they think as they do. What is it in the compositions that make them think of bumble bees or typewriters? Tell learners that they are going to compose a piece of music to reflect a chosen subject, this could be anything: elephants, war, their mother! 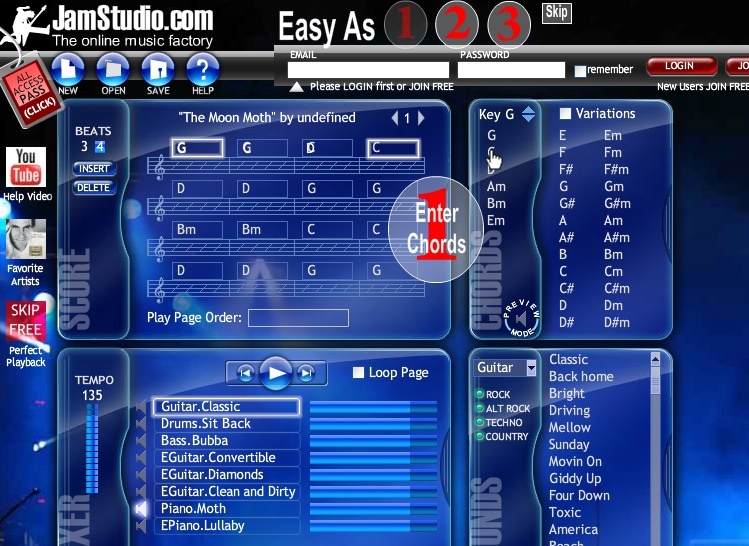 Click a chord in the CHORDS window to enter it into the SCORE window. In the MIXER window, click the speaker button besides the instruments you want to play. To speed up or slow down, slide the TEMPO bar up or down. Type page numbers separated by commas (no spaces) into the play page order field. If you’re using our example, draw their attention to the musical elements, principally tempo, melody and instrumentation. Explain that each of these were deliberate choices that were made to portray a moth flying to the moon. The melody has a strong sense of beginning, middle and end – it doesn’t begin or end too abruptly. 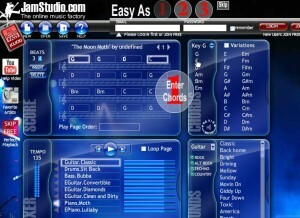 Learners are now be ready to make music! Prepared thematic compositions e.g. Flight of the Bumble Bee/The Typewriter. Teaching learners to compose using a graphic score and un-tuned instruments is relatively easy however creating melodies using chords is much more challenging. This activity is a great way to introduce learners to many of the concepts of composing with the added bonus of creating a polished piece of music by the end of the lesson. It is possible to email finished compositions to parents! Click the SHARE tab and follow the prompts. It may be useful to discuss some of the assumed settings on the software with learners e.g. there are 4 beats to every bar, and one chord in every bar. The chords are in ‘G’. The beats and the key can be changed, but unless you and the learners are very confident in composing music and are familiar with the software, we suggested you tell learners to leave these settings unchanged. You don’t need to register in order to use the software. However, if you do choose to register, you don’t need to pay any fees in order to access what you’ll need for this activity. You may choose to ask learners to compose a group piece, this enables up to 3 learners to share a computer if you do not have enough for everyone individually. Experiment with creating advertising jingles or radio jingles. Use compositions as backing tracks for presentations on PowerPoint or video. Write lyrics for their compositions. It was a pleasure to use this software. I love it! Have had great verbal feedback from teachers reagrding this lesson. They think it is especially good for teachers who are NOT music specialists and those who normally find teaching music difficult and intimidating. One teacher said “It made me feel confident in teaching music!” Learners enjoyed it too and were quite surprised by the quality of their own (and peers’) compositions. we looked for an easy program to create music. they can also listen to each other’s creations. It went very smoothly, the students liked it! The program that you propose seems to go a step further. and asked him to test it with his students. The examples that are given and the method to use music in the classroom are certainly inspiring. I hope to get a quick response from the teacher, this is a very interesting lesson, thank you! Excellent. I shall check out the software you used. Let us know what the teacher thinks of jamstudio. After reading this activity I can say that It’s very interesting and useful speacially for the childs, also the teacher are so nice with the programm. Acording to description the childs can produce and listen their compositions and the other one’s composicions. Also the tutorial helps them to create the composicions, for these reason I think that is a very interesting Music Maker. Besides there aren’t any programm like this in the educacion world. This educational experience may relate primarily to the matter of philosophy, it makes students aware of the concept of time. The interesting thing is that it does so through the use of ICT, in this case a camera, a tool that everyone has access today. And also use a presentation program that makes it more enjoyable and visually more attractive to children. Also at the age of 9 and 12 years, children are beginning to think in more abstract things and time is something we first reflect. The development of this task will also be useful in the future it will already be familiar with these tools of ICT. This practical experience is it helps students to express themselves in various ways, in this case with the musical language. Besides giving the opportunity for children to relate to people, objects and context with the emotions that music makes us feel. Also when using presentation software can add your own music to express what they feel a particular job.